Specimens of Batillipes tubernatis Pollock, 1971 collected from the Portuguese coast (Lusitanian sea province) indicated a considerable southward extension in the distribution of the species along the northeast Atlantic Ocean. Based on the examination of these specimens and those of Pollock’s collection from the type locality (Scotland), it can also be concluded that the redescription of B. tubernatis based on specimens from the Gulf of Mexico (tropical northwest Atlantic Ocean) does not correspond to that species. Several differences, namely in the shape of cephalic appendages, toe discs and pattern of cuticular sculpture, clearly distinguish specimens of B. tubernatis from those collected in the Gulf of Mexico that certainly belong to a new unnamed species. Moreover, the examination of specimens previously collected in the southwest Atlantic Ocean (Brazil) and attributed to B. tubernatis showed that they belong to other undescribed new Batillipes species, suggesting that B. tubernatis does not occur in that region. Additionally, the only record from the temperate northwest Atlantic Ocean attributed to this species cannot be assigned to B. tubernatis either. Therefore, a clarification about the current taxonomic status of B. tubernatis is provided and a short characterisation of the habitat of this species on the Portuguese coast is presented. 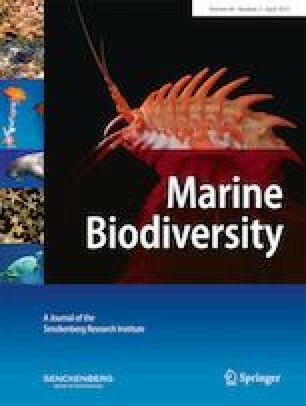 As the occurrence of the species outside the northeast Atlantic Ocean is questioned, this work should renew the discussion about trans- and cis-Atlantic distributions of meiobenthic species. The authors are grateful to Leland W. Pollock for donating his entire marine tardigrade collection, including B. tubernatis. This research was partially funded by Polis Litoral Norte, S.A. through the project “Estudo de caracterização da actividade pesqueira costeira e dos seus impactes nos recursos e nas comunidades marinhas do Litoral Norte”, the European Regional Development Fund (ERDF) through the programme POFC-COMPETE, Quadro de Referência Estratégico Nacional (QREN) and also by the Fundação para a Ciência e Tecnologia (FCT), Portugal, through the project Pest-C/MAR/LA0015/2011 and through the strategic project UID/MAR/04292/2013 granted to the Marine and Environmental Sciences Centre (MARE). During this study, M. Rubal (SFRH/BDP/104225/2014) and P. Veiga (SFRH/BPD/81582/2011) were supported by postdoctoral grants awarded by Fundação para a Ciência e Tecnologia and É. Santos (BEX 13580/13-2) by a doctoral grant awarded by the programme Science Without Borders from the Coordination for the Improvement of Higher Education Personnel, Brazil (CAPES). All applicable international and national guidelines for the care and use of animals were followed by the authors.